There have been two dispersions in Israel’s history collectively referred to as the Diaspora. The first dispersion of Jews from the land of Israel began in 721 B.C. when the Assyrians invaded the Northern Kingdom of Israel and led them away into captivity for their gross idolatry and disobedience to the Law of Moses (Isaiah 10:5-7; 2 Kings 17:5-23). The last stage of this dispersion occurred in 586 B.C. At that time, the Babylonian armies led by King Nebuchadnezzar laid siege against Jerusalem and conquered the Southern Kingdom and took the Jews of Judea and Jerusalem captive into Babylon for seventy years (Jeremiah 25:4-12; Daniel 9:1-2; 2 Chronicles 36:14-20). In 539 B.C., the Persian king, Cyrus, issued a decree allowing 50,000 Jews to return to the land of Israel under the leadership of Ezra, Zerubbabel, and Nehemiah (Ezra 1:1-6:22; Nehemiah 11:1-13:31). Both the Assyrian and Babylonian invasions are considered a single dispersion instead of two since half of the nation went into exile in 721 B.C. and the other half going into exile in 586 B.C. But before God scattered them in the first dispersion, He gave them warning after warning to forsake their disobedient and wicked ways through His servants, the prophets. Israel did not heed their warnings of divine judgment and calls for repentance. Because He knew they were reprobate and unwilling to return to Him, the Lord displaced and scattered them from the Land (Jeremiah 5-6; 8:7-17; 2 Chronicles 36:14-17). 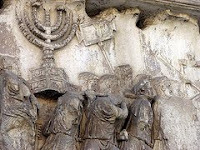 The second dispersion of the nation came in 70 A.D. when Titus and his Roman legions burned and razed Jerusalem and razed the Temple, literally not leaving one stone upon another, thus fulfilling the prophecies of Micah and Jesus, found in Micah 3:12 and Matthew 24:2. In fact, in the early 1990’s, archaeologists doing excavations along the southern part of the Western Wall unearthed a pile of those original Temple stones that were dismantled stone by massive stone in 70 A.D. - an ancient testament to the veracity of Jesus’ prophecy and the historical accuracy of the New Testament. The Bible not only predicted the fact of Israel’s dispersion, but also the condition the Jews would be in during it. The Jews would not have a king to sit on David’s throne, nor would they have a Temple in Jerusalem, nor priesthood to offer sacrifices; and finally, they would no longer worship idols. In this prophecy as with several others found in the Old Testament, Israel’s state and condition is accurately described during the long worldwide dispersion of their nation that has existed between the first and second advent of the Messiah Jesus! A closer look at the text in Hosea 3 provides a very detailed corroboration of how this prophecy is being fulfilled from the time of the first century A.D. until now. This period of Jewish history (which has already lasted for almost two thousand years) has been formally called by Jewish and secular historians “the Diaspora”; and it was foretold in the prophetic word in Hosea some 750 years before Christ! In this dispersed state, Israel would no longer have a “prince or king.” The throne of David has been vacant of a lineal successor (a prince) and broken down since 586 B.C. to this very day. This will remain so until the return of Jesus the Son of David who will sit on the Davidic throne after a long period of absence (see Ezekiel 21:25-27; Luke 1:32-33; Acts 15:14-17). With the destruction of the Temple in 70 A.D. and the subsequent dissolution of the Levitical priesthood, Israel was left without the appropriate animal sacrifices or a Temple to sacrifice them in. They would no longer worship false gods in temples built with “Sacred Pillar” commonly used to worship the false gods of Canaan (Ex 34:13-14; Deut. 7:5). The “Ephod” was a part of the special dress the High Priest of Israel wore and also gave divine guidance and direction (Lev. 8:7; 1 Sam. 23:9-11; 30:7-8). Thus, Israel would be scattered throughout the world without centralized spiritual leadership and guidance provided by the High Priest for the nation. In addition to that, the Jews would be free from idolatry and the worship of idols or the “Teraphim” while in a scattered state. The teraphim images in ancient Israel were household idols used for objects of worship and the forbidden practice of divination (see Gen. 31:19, 30,32; Jud. 18:17, 24; 1 Sam. 15:23; 2 Kgs. 23:24). “This prediction has been remarkably fulfilled in the condition of Israel since the time of Christ. Scattered, without political entity under a king or a prince, and performing no sacrifices since the destruction of the Temple by the Romans in A.D. 70, they have yet retained their identity and avoided idolatrous worship of sacred stones or idols. Chapter 3 is one of the classic O.T. passages describing Israel’s past, present, and future.” (The New Scofield Study Bible, p. 894).